WetCat | The Ego Co. When one thinks of fashion creators in Second Life, Indyra Seigo is at the top of the list! The designs at Indyra Originals are undoubtedly some of the most fashionably unique creations on the grid. If you have not visited Indyra Originals lately, I have three designs which will have you rushing to the entrance of the main store! There is something for every budget at Indyra Originals! I found the Fallon outfit for only L$100 during my recent visit! This outfit includes the jacket, leggings, belt, and the lace choker with brooch. I love this creation for it’s modern interpretation on a Victorian era style! If you love glamour, you’ll love Garbo! The beautifully feminine outfit includes the blouse, slacks, gloves, and the top hat for only L$495! This outfit is a styling dream! It can be paired with draping necklaces, brooches, and so many other accessories! I look forward to seeing what others create from this elegant design! The last creation from Indyra Originals I have to show you is the exquisite Paloma! As you can see in the photo, this creation enables you compose a huge variety of captivating looks! The outfit includes the elegant skirt, slacks, sheer top, strappy top, gloves, shoulder poofs, two bow attachments, and rose attachment for only L$995! That’s an extremely wonderful value for the variety of looks you can create! There are many other releases awaiting you at Indyra Originals! While you are there, be sure to join the group to stay updated on new releases and events! Happy Rezzday to me !! Hey my darlings today it`s my rezzday and I didn`t knew till I recived a cake from secondlife.com, I was so surprised. I have made 2 years in sl and tho I am little comparing with others I am proud of what I achieved with my blog. Cosmopolitan may not be the best for others but for me it`s a great blog and I am proud of my evolution. Thank you to all my readers and followers for sticking with me even when I don`t post because of lack of my inspiration or rl busy, thank you to all the creators that are sponsoring me, each one of you are so talented and I am proud to be your “model” 🙂 , and thank you to all my fellow bloggers for being so nice and suportive. I wish everyone to have a beautiful day ! More from the Costume Ball! As promised, I have more creations from the Costume Ball being held by The Ego Co.! The event will continue until November 1st; therefore, you still have time to pick up items for your Halloween events. For my Halloween look, it seems I am attracted to masks. Ploom has created a bewitching hair style which can be worn with the mask revealing the face, covering the eyes, or without the mask. The hair is available in a variety of colors and the mask is color change through the menu to coordinate with your outfit. What I love about masks is that they can be very elegant and intriguing, especially when the attention is already captivated by what is visible. I think you will agree Pink Fuel’s Siren skin with the included lip glaze from the Femme Fetal series, created by for the Costume Ball, will captivate plenty of attention with or without a mask. While looking around the Costume Ball, I melted when I saw the Gothic Dress from *RoTtEn DeFiAnCe*. This lush gown is exquisite in style, fabric, and color. I think you will agree that the design beckons attention and will create a dramatic entrance. I also found the Puppeteer prop from Evolve that I used for the photos. This prop is fantastically created! 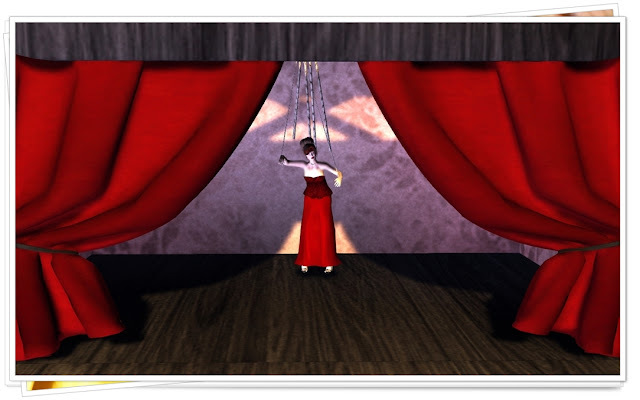 The prop includes the stage with curtains, five poses, mesh ropes which attach to the wrists for each pose, and you can also adjust the poses in the prop through chat! These items and more can be found at the Costume Ball!